bl.uk > Online Gallery Home	> Online exhibitions	> Asia, Pacific and Africa Collections	> Unfinished sketch. 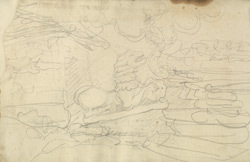 Unfinished pencil sketch by Robert Smith (1787-1873) in 1815. This is one of 21 drawings (27 folios) of operations and scenery in Sirmur, Almora & Kumaon (Uttar Pradesh) during the Nepal War, 1815. Inscribed on the original album cover is: 'No. 7. Almorah & Kumaon.' Captain Robert Smith was a military engineer with the East India Company and was in India from 1805 to 1833. He designed a number of buildings in India and also repaired various Indian monuments including the Kutb Minar and the Jami Masjid at Delhi. This sketch was taken during the time of the Nepal War (1814-16) when Smith served as Field Engineer.